Our quaint island paradise is the perfect place to relax on the beach or do some shopping…but did you know that you’ll find history around every corner while you are on St. Simons Island? Home to Ft. Frederica, Christ Church, The St. Simons Island Lighthouse and several trolley companies, there are many ways to explore the rich history of the island. Fort Frederica– This centuries old fort is located at the northern end of the island was established in 1736 and still stands today as a testament to the dreams, struggle, victory and defeat of the early colonists. If you visit the fort, there are ranger-led tours and re-enactments that take place throughout the year. While learning about the history of the fort, you will take in breathtaking views of the marsh and see many coastal birds. The fort is open 7 days a week from 9am-5pm except for certain holidays. 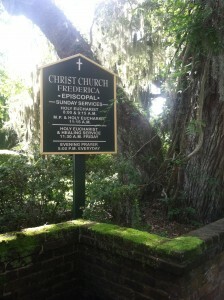 Christ Church– In 1763, John & Charles Wesley (the fathers of the Methodist church) began holding services under the live oak trees on the property. The church as it stands today, was built by Anson Phelps Dodge, Jr. as a memorial to his late wife. From the beautiful gardens to the interior of the church, to the love story that it tells, this church is a lovely place to visit for an afternoon during your trip to St. Simons Island. St. Simons Island Lighthouse– The lighthouse is one of only 4 active lighthouses in Georgia. Climb the 129 stairs to the top for a spectacular view of the village, St. Simons Sound and Jekyll Island. While you are visiting, be sure to spend some time at the attached A.W. Jones Heritage Center where you can learn about the coastal heritage of the island. The lighthouse is open daily. View their website for information on specific days and times. For more information about historic tours and sites as well as trolley tours, visit our website. This entry was posted on Thursday, July 17th, 2014 at 6:28 pm	and is filed under Area Events and Info. You can follow any responses to this entry through the RSS 2.0 feed. Responses are currently closed, but you can trackback from your own site.